Who would have ever thought that eating a heavy meal before going to bed would result in you have some of the most intense hunger pains before dawn? As feisty as my appetite is, I figured I would have some kind of reprieve from being ravenous. No, that is not the case. A rather late, large dinner on Saturday night and I wake up wanting to bite my comforter, the curtains, my flat mate — although she would be better simmered in a curry gravy, first, and whatever was in my refrigerator. Now I know how vampires must feel when night falls and they begin their hunt for necks to bite. It is just that uncontrollable. As with many weekend mornings, I like to get my teeth to gnashing away at something eat-worthy from the breakfast group. Although I have a lovely suite of gadgets in my kitchen — oh to be a man who has gadgets — I simply do not own any of the breakfast toys: waffle irons, pancake griddles, cast iron skillet, juicing gadgets, and the like. That means I have to go to some establishment and let a chef, cook, or experienced amateur work magic in the kitchen and produce something that leaves me clapping and shouting Bravo! 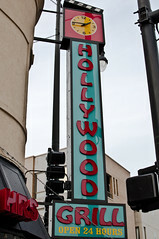 The foodie in me had me on my way to Hollywood Grill at 1601 W. North Avenue in Chicago’s Wicker Park. Packed as I have heard several people say, I found one empty seat at the counter between what looked like a lumberjack and a kingpin. There were so many options on the menu. Now repeat that about five more times. 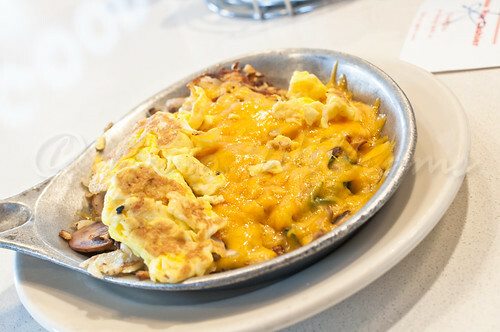 Because the Hollywood Grill is a diner that keeps its door open twenty-four hours a day, the menu is indeed extensive with breakfast, lunch, and dinner options. After thumbing through the pages for a few minutes, a server came to me with a laser beam smile. I have a feeling that she was perhaps new on staff because that smile had not yet been tarnished. Nevertheless, I ordered a skillet of eggs scrambled well with mushroom and spinach over hashbrowns. Talk about filling. Not heavy-handed on the salt, the mushrooms and the spinach had centre stage with flavour. I was also very glad that the eggs were not under-scrambled to the point of introducing a bit of running and not over-scrambled to the point where they were like eggs injected with Botox. Add to that me having my say with a plate of pancakes that were light and fluffy, I was a satisfied man. 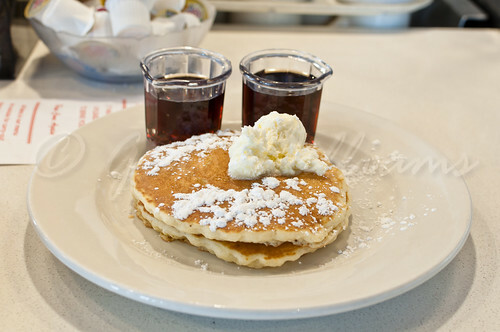 Side Note: It would be a stroke of genius if International House of Pancakes made their pancakes airy like the ones at Hollywood Grill. Those dense what-nots tend to induce food comatose. To most, the service can seem a bit out in left field. That is mostly because the diner is so incredibly busy, teeming with people coming and going in a constant blur. One thing I noticed sitting at the counter was that there is apparently a tide of regular customers who come through. So many taking seats and engaging the wait staff in Spanish talking about “the neighbourhood,” church, family members, and dinner gatherings gave a strong indication that Hollywood Grill not only serves good food, but it also fosters an atmosphere of community. New York City may have a monopoly on getting the concept of a diner correct. But Hollywood Grill has a monopoly on getting the concept of good food and splendid service correct in our very own Gotham here in Chicago. And if I find myself wanting to bite everything within reach again in the middle of the night, I will make Hollywood Grill my destination for easing my craving.